Wider Yachts is proud to announce that construction of the first unit of Wider 150′ yacht has started in its new shipyard in Italy‘s Ancona this year. The company is currently attending the 54th edition of the Ft. Lauderdale International Boat Show, presenting its all-new motor yacht Wider 42′ Cote d’Azur Edition. Motor yacht Wider 150’ inspiration comes from the sea itself, immense and limitless, which nature is an irresistible invitation to never ever stop. 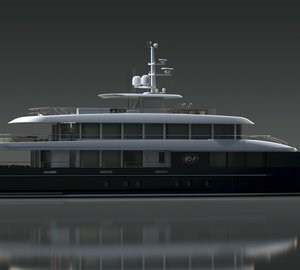 A yacht with extraordinary proportions that reminds one of the elegant vessels of the early 20th century, Wider 150’ has a strong vocation to luxury with highly innovative solutions – to date only available for yachts measuring over 200’ – to offer excellence and refinement, on-board a highly technological, cutting-edge setup. At the base of this incredible project are Fulvio De Simoni’s design together with the large experience of Tilli Antonelli and his team, who have always focused on continuous research and “going beyond the boundaries” to produce yachts of dynamic performances and great on-board comfort, enhanced by sophisticated and yet user-friendly technology, with special attention to details. The beating heart of superyacht Wider 150’ project focuses on the use of a diesel/electric propulsion system, which guarantees hugely reduced consumption and unthinkable range. This system has made it possible to relocate the engine room to the bow, using the unexpected space in the finest area of the ship to create larger, more comfortable guest cabins. This system is also completely modular: the yacht can reach a range of around 5 hours and 25 miles of cruising with all the on-board services running and using just the electric engines powered by the batteries. 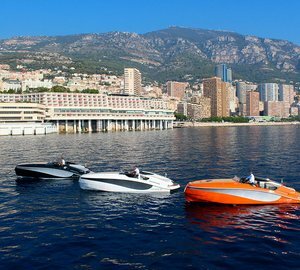 If the diesel groups that lower the electric engines are included, on the other hand, the yacht can reach a further three different speeds and relative ranges. Furthermore, the semi-planning hull offers unquestionable added value in terms of high speed and a greater range. Design focuses on the intelligent use of on-board spaces, improving integration of the systems and offering a reduction in emissions and consumption without underestimating the importance of easy maintenance. 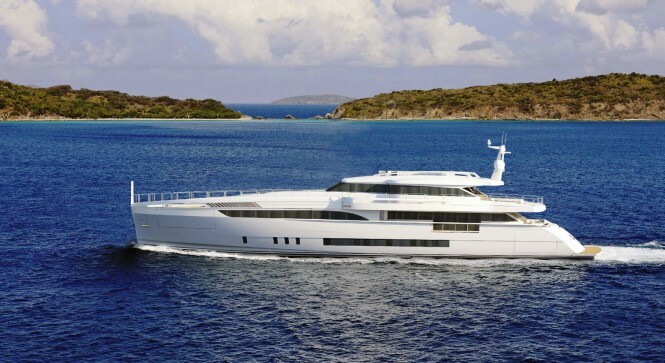 For these reasons the material chosen for the entire construction of the Wider 150’ yacht is aluminium, a noble, durable metal that, being particularly lightweight, makes it possible to increase the performance/consumption ratio of the yacht, and a considerable reduction in emissions which, combined with the fact aluminium is completely recyclable, means a policy for protecting the environment can be implemented. Aluminium gives also greater freedom during building as it increases the opportunity to customize and considerably shorter production times. This material is not just lightweight, but also resistant and flexible. It is versatile, supple and yet sturdy, making the yacht even safer. Luxury yacht Wider 150’ is characterized by extremely clean lines and trim, polished surfaces. The aesthetic balance of the lines mirrors the overall balance of the project, conveying harmony between ship and sea, both for the comfort of life on-board and environmental impact. The size of the stern area is extraordinary for a ship of this size and contributes substantially to making life in direct contact with the sea even more pleasant, fully respecting the Wider spirit. This is also thanks to the beautiful indoor swimming-pool and large “Wider Beach”. Besides the stern, all the other details of the ship have been studied to emphasize direct contact with the great outdoors, beginning with the large glazed surfaces that open out onto each deck, bringing huge amounts of light indoors. The interiors mirror the simple lines of the exteriors, with the carefully studied choice of a few dominant colours and alternation of polished and opaque surfaces. The upper deck provides for a salon and a lunch area adjacent to the large windows, designed to ‘disappear’ and give access to the side terraces, for a continuous dialogue between indoor and outdoor. The main deck features a stern area consisting of a well-equipped external cockpit and large interior salon split into two living areas. Forward, on the other hand, there is the master suite which stretches out over the entire width of the yacht bringing huge amounts of light into this area and offering an unparalleled panoramic view. Moreover, the master cabin is split into two separate areas by a sliding wall. Indeed, besides the cabin itself, there is a salon/office where the broadside opens outwards to create a beautiful private terrace overlooking the sea. The captain’s cabin is located aft of the steering station, enabling him or her to have complete control of the ship at all times, whilst the forward area of the lower deck is destined for the crew quarters and various services. There are four spacious cabins with en-suite heads for guests, who, thanks to an external connection between decks, can access all the external areas without having to go through closed, air-conditioned zones. 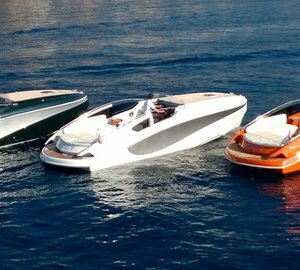 The Wider 32’ is housed astern and thanks to the project and her specific size is, to all effects and purposes, an extension of the main unit and not simply a tender. She has been specially designed to guarantee owners enjoy maximum comfort even during excursions without the mother ship, and the yacht features a floating launching system for carrying out entry/exit manoeuvres with the floating tender. The space that is freed up after launching the tender ‘magically’ transforms into a seawater swimming-pool surrounded by a real Wider beach, thanks to the opening of two side wings and the overturning of the platform. The design of the bow, on the other hand, provides housing for the water toys. This part of the maxi yacht is also characterized for its extreme versatility: the part of the deck above the tenders rises up to the level of the deck to become a touch ‘n’ go helipad on request. Moreover, the bow features a large, comfortable, unexpected patio which appears in just a few seconds by raising the upper section of the deckhouse. Thus, the yacht offers an area of complete privacy during mooring and a great view anchoring at port. Construction of the first unit of Wider 150’ yacht has started this year in the new shipyard in Ancona. The start of construction was preceded by a series of fundamental technical tests, from a program of tank tests, followed by a paint flow tests and by the evidence of self-propulsion. The results of these tests have confirmed the high expectations of the Yard and the validity of innovative technological solutions. Please contact CharterWorld - the luxury yacht charter specialist - for more on superyacht news item "First unit of Wider 150' Yacht under construction at Wider Yachts".